But First, What is Hygge? Hygge is a somewhat complicated term, but is best described as the Danish concept of happiness. It is a very specific kind of happiness though, that incorporates coziness, nostalgia, appreciation, and joy. It is a concept that has been passed down for generations and is often credited as being a huge force behind the consistent happiness rating that so many Nordic nations receive. If you’re interested more in hygge, one of the best books I’ve read on the subject is called The Little Book of Hygge: Danish Secrets to Happy Living. It’s a great book and well worth the read! In addition to Easter itself having a very special meaning to many families, it’s also a perfect way to welcome spring into our lives. Homemade Easter decorations are one of the best ways to do this, but don’t forget the most important part – they need to be homemade. Making something yourself is a very important part of hygge. It forces you to slow down, appreciate the season, and put thought and time into something. If you can make these decorations with your family and friends, then you’ve doubled your hygge! Don’t stress yourself out by choosing a complicated or professional looking design. There are tons of simple options that will look beautiful and that you’ll actually enjoy making. If you have kids, use this as an opportunity to pass down a fun family tradition and make special decorations each year. This is one of my favorite Hygge Easter ideas and I can’t wait to turn it into a beautiful family tradition in my house. Similar to the more popular Christmas Advent calendar, an Easter Countdown Advent Calendar is the exact same concept – a fun countdown until Easter! 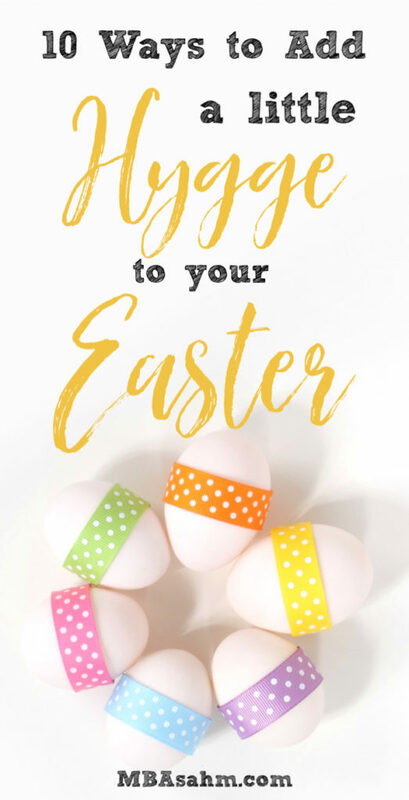 What I love about an Easter countdown, however, is that it doesn’t need to be a little gift or trinket each day – it can (and should) be a fun Easter activity or craft, a person to call or send a letter to, or even just something to be grateful for. An Easter Advent Calendar is the perfect way to incorporate hygge into each day leading up to Easter! Stephanie at Somewhat Simple has a fabulous Easter Countdown Calendar tutorial that is extremely simple, and better yet, she includes really great ideas to put into each egg (or day) leading up to Easter. If you’ve got kids, I highly recommend you consider doing this with your family! 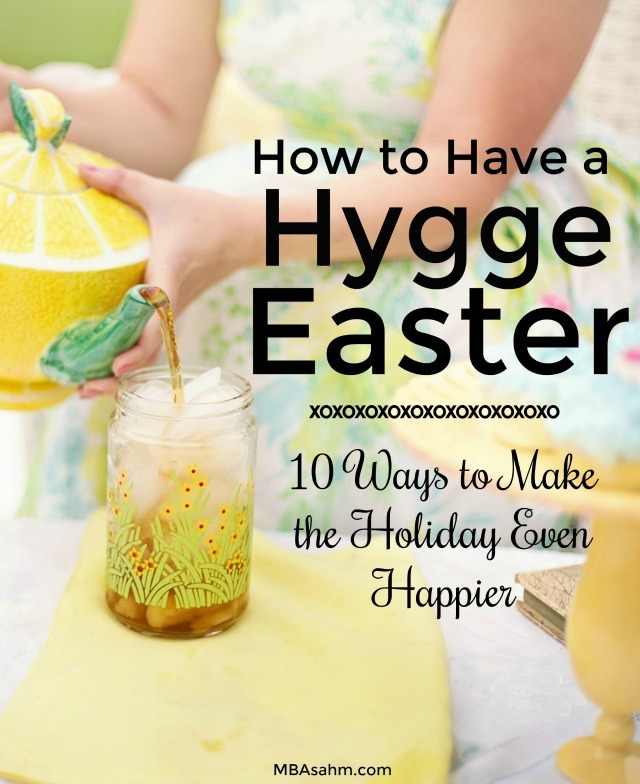 It’s one of the best hygge Easter ideas out there. Hygge embraces the outdoors whenever possible. Unfortunately, depending on where you live it may not be possible. But if you can move your traditional Easter morning egg hunt outside, you should! There’s something special about being outside, especially when you’re having fun with family. To make the egg hunt easier (on you), but just as fun for the kids, consider using plastic eggs (even if they’re empty) that can get wet or withstand the elements if they aren’t found. If you’re kids are at the right age, you can also try a glow-in-the dark nighttime egg hunt once it gets dark! Anything handmade is in the spirit of hygge. But when you make something for someone else, it’s a whole new level of hygge. You are savoring the moment, putting thought into something, exercising your brain, AND sharing all of that love with someone else. If you’ve got kids, this is the perfect opportunity to set up some easy and fun crafts that can be sent to loved ones. AND of course, these activities are great to add to your Easter Countdown Calendar! Hygge and reading go hand-in-hand. If you have kids, this is the perfect time to incorporate Easter-themed books into your day. This is also a great activity to add to your Easter Advent Calendar! Whether you are reading with your kids or not, make sure to truly take advantage of the reading time by putting yourself in a cozy and calm spot. Grab a cup of tea or hot chocolate for the kids to make this time even more special! If you aren’t reading with kids, make sure to pick a book that you truly enjoy. This isn’t the time for homework or “heavy” reading. This is a special time for you to spend with yourself reading something that will make you feel warm and fuzzy on the inside. So pick wisely! Just like with homemade gifts, homemade Easter cards will have the same effect! There’s no reason to go spend a ton of money on Hallmark cards though. Instead, just spend some time with your kids helping them create beautiful artwork that you can send out. 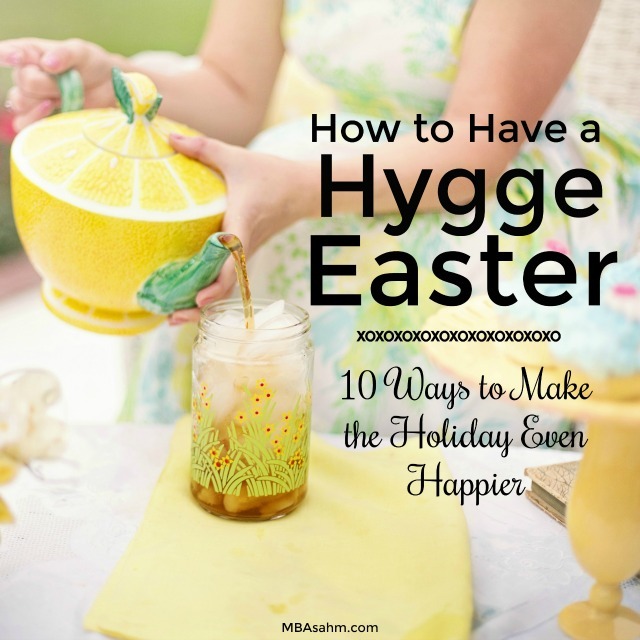 Just as with so many other things on this list, this is a great idea to add to your Easter Countdown Calendar and also a great tradition to start with your kids (family traditions are a huge part of hygge!). This is most likely something you’re already doing, so give yourself a big hygge pat on the back! Not only is this a great Easter decoration and fun activity for Easter morning, but it’s a great way to spend time with your kids leading up to the big day. There are tons of ways to decorate Easter eggs, so don’t limit yourself! And remember, not everything needs to be perfect or professional looking. For some kids, just being able to cover eggs in Easter stickers is a dream come true. After a day of festivities, food, and excitement, what better way to wind down than to curl up together for a traditional movie night? Not only is this a great way to maximize your family time, but there are a lot of great family movies that can become Easter traditions to watch each and every year (even if they aren’t totally Easter-themed). To make things extra hygge-like, make sure you’re all cozy and comfortable! Grab some warm blankets and curl up together. Make some tea or hot chocolate for the kids! It’s likely that you already have traditional Easter dishes that you make and a special Easter feast planned – so another hygge pat on the back for you! Home cooked family meals are an integral part of the hygge experience, which is one of the reasons Easter is a perfect time to embrace hygge. If you aren’t already doing so, try bringing your kids into the cooking process. Trying to enjoy making the meal as much as eating it. If you can use the eggs you made for dying Easter eggs, even better! Hygge is also found in warm and delicious smells, so if you have Easter crock pot recipes or casseroles that simmer or bake for a while, you’ll be able to fill your house with the smell of hygge! I hope you get a chance to try out each of these hygge-infused ideas! Have a very hygge Easter! !